Mission: To encourage and support scientific research that benefits the North American alpaca industry in the areas of health, husbandry, genetics and fiber. Alpaca Research Foundation investigators have mapped the alpaca genome, tested vaccines and drugs and are developing new treatments for infectious diseases. 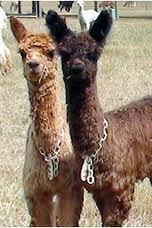 100% of the donations to Alpaca Research Foundation goes to support research projects.